Focus is power. Scheduling leads to focus, which can dramatically save time. For years, I have advised organizations and individuals on the power of the forward project schedule, that is, keeping a list of projects organized by which quarter they will be done in. That’s how scheduling allows for focus, which leads to better results. It’s power. On a personal level, focus is power, too. David Allen’s canonical book, “Getting Things Done” gives readers some important advice: “Do, delegate, defer, or drop,” he says. Deferral is not a cop-out. It allows you to clear the deck, make time for present tasks. I use my calendar as a “three dimensional to-do list”, and I schedule certain tasks because doing this tells the little hyperactive gremlin in my brain that it will get done, quit worrying about it. That frees up my little hyperactive gremlin (who is a powerful and insistent little guy, let me tell ya) to focus on and do other things. But perhaps more importantly, scheduling tasks that are alike to be done at the same time allows you to get into flow and be more efficient about all of those tasks. What’s flow? Flow is a psychological state where you are “in the zone.” Where you’re feeling awesome about knockin’ it out. Trouble is, for most of us, it takes some time to get into flow. And by the time we get into flow for a given task, then we switch gears, to another task. And we’ve got to ramp up all over. 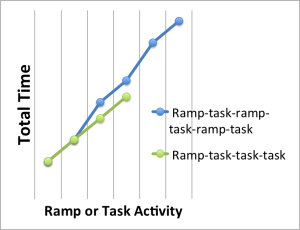 So instead of RAMPTIME+TASK+TASK+TASK, you have RAMP+TASK+RAMP+ TASK+RAMP+TASK. This is clearly less efficient. Some examples in my world: I schedule time to write performance reviews during the same work session. I use WordPress scheduling to write multiple postings and then schedule them. Don’t have a technology feature that allows for scheduling? Go “low tech” — schedule time to do several similar tasks, then attach the work to a calendar entry for handling in the future. Create focus through scheduling. It leads to more efficiency, better work results, and … of course … more spare time.